The long-awaited Buckland Park development north of Adelaide is in administrative limbo, but Planning Minister Stephan Knoll says the proposal has merit and he’s considering granting yet another extension to its development approval. The residential development proposed by Walker Corporation was first given major project status in 2007 by then Labor Planning Minister Paul Holloway, before being given development approval in 2014. Since then, the project has been subject to delay after delay, and extension after extension to its development approval, but Walker Corporation founder Lang Walker remained upbeat today, promising imminent action. The latest deadline to begin substantial works expired at the end of October, but the State Government says this doesn’t mean the approval has been rescinded. “This development has a lot of merit and I am currently considering granting an extension for development approval,” Knoll told InDaily in a statement. There was no explanation from the Minister or his department about why there has been a delay in extending the approval, although InDaily understands discussions are ongoing between the parties about how some of the infrastructure will be delivered. The key infrastructure requirement at this early stage of development is the upgrade of the intersection of the project with Port Wakefield Road. The site of the Buckland Park project in the original major project declearation. A spokesperson for the Department of Planning, Transport and Infrastructure confirmed that Walker Corporation had applied for an extension before the current approval expired. 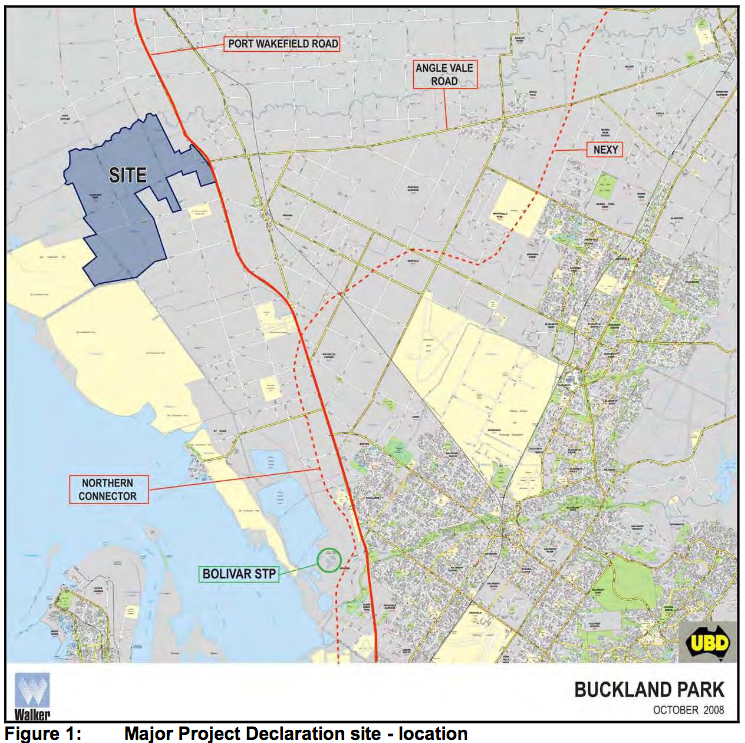 “The current development approval applicable to the Buckland Park Major Development proposal requires that substantial works be commenced on site by 31 October 2018,” the spokesperson said. “The allocated date is one set through the Major Development process and its exceedance does not automatically mean that the approval expires. The project, dubbed ‘Riverlea’, aims to create a community of 12,000 homes for more than 30,000 people by 2036. Walker’s ‘Riverlea’ website disappeared in 2016 without explanation. However, Walker Corporation boss Lang Walker was positive about the project in a statement provided to InDaily today, promising that Riverlea would be the biggest residential development in SA for more than 35 years. In a statement, he said the Port Wakefield intersection upgrade would begin soon and the company would soon be tendering major infrastructure works to start in early 2019. He said approvals were in place for infrastructure on the 1300-hectare site, including the NBN, potable water, sewerage and gas. Walker was positive about the broader context for the residential development. “The Adelaide housing market, especially in the northern corridor, continues to perform strongly, outperforming the eastern states, with no signs of any future decline,” Walker said. The Liberals when in Opposition were sceptical about the project. In 2016, as the then-Labor Government granted another extension to the planning approval, Liberal deputy leader Vickie Chapman raised long-standing concerns about the susceptibility of the area to flooding. She said at the time that the land had been inundated in heavy rains, with the local waterways silted up. “There’s been huge flooding,” she told InDaily. Millions would have to be spent on flood mitigation before the site would be suitable for building, she said. Greens leader Mark Parnell once described the development as “a ghetto in waiting” due to its isolation from transport services.